Geometry transformations return a new geometry. The purpose of a geometry transformation can be to achieve special effects for symbol rendering and labeling. Geometry transformation is available at the LAYER level and the STYLE level. At the LAYER level (since 6.4), the original vector geometry (“real world” coordinates) is used. At the STYLE level, pixel coordinates are used. GEOMTRANSFORM bbox returns the bounding box of the geometry. Only available for STYLE in the CLASS context. GEOMTRANSFORM centroid returns the centroid of the geometry. GEOMTRANSFORM end returns the end point of a line. GEOMTRANSFORM start returns the start point of a line. The direction of the line at the start / end point is available for rendering effects. Class definitions for the example. GEOMTRANSFORM vertices produces the set of vertices of a line (with direction information). These are used for label styling (background colour, background shadow, background frame). The result of using labelpnt is affected by the LAYER LABELCACHE setting. If LABELCACHE is ON (the default), the label will be shifted when a non-zero sized symbol is added using labelpnt . 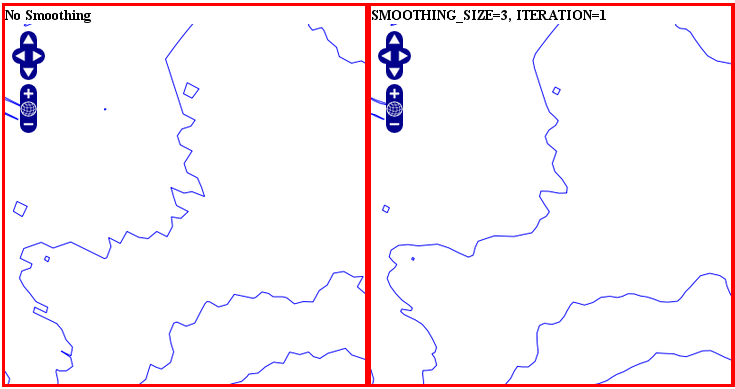 GEOMTRANSFORM labelpnt produces the geographic position the label is attached to. This corresponds to the center of the label text only if the label is in position CC . GEOMTRANSFORM labelpoly produces a polygon that covers the label plus a 1 pixel padding. Only available for STYLE in the LABEL context. These transformations can be used to make background rectangles for labels and add symbols to the label points. A geometry transformation produces a geometry, and that geometry can be used as input to another geometry transformation. There are (at least) two ways to accomplish this. One is to combine basic geometry transformation expressions into more complex geometry transformation expressions, and another is to combine a geometry transformation expression at the LAYER level with a geometry transformation expressions or a simple geometry transformation at the CLASS STYLE level. Combining geometry transformation expressions A geometry transformation expression contains a [shape] part. The [shape] part can be replaced by a geometry transformation expression. 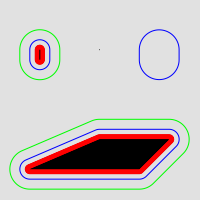 In this transformation, buffer is first applied on the geometry ( [shape] ). The resulting geometry is then used as input to simplify . The result of this transformation is shown at the top of the following figure (red line). The original polygon is shown with a full black line and the buffer with a dashed black line. Combining expressions with simple geometry transformations Simple geometry transformations are only available for CLASS STYLE , but can be combined with geometry transformation expressions at the LAYER level. 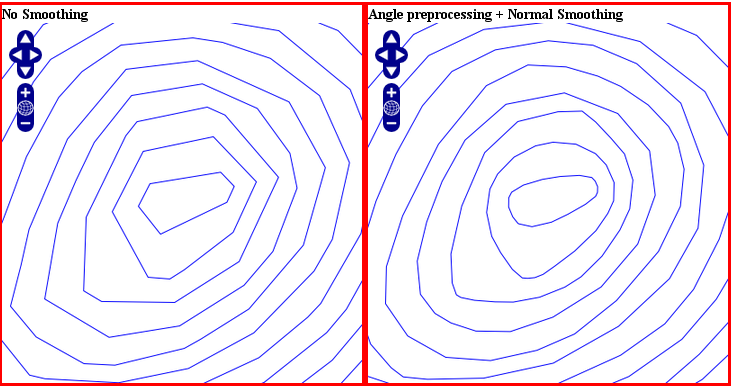 The result of this transformation is shown at the bottom of the following figure (the red lines). The result of the LAYER level geomtransform is shown with a full black line. 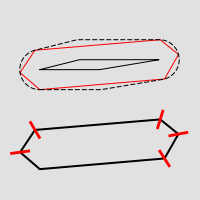 The original polygon is the same as the one used at the top of the figure. GEOMTRANSFORM buffer returns the buffer of the original geometry. The result is always a polygon geometry. Negative values for buffersize (setback) is not supported. Can be used at the LAYER level and for STYLE in the CLASS context. Buffer does not seem to work for point geometries. Some class definitions for the example. 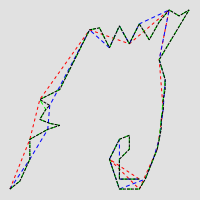 GEOMTRANSFORM generalize simplifies a geometry ([shape]) in a way comparable to FME’s ThinNoPoint algorithm. See http://trac.osgeo.org/gdal/ticket/966 for more information. tolerance is mandatory, and is a specification of the maximum deviation allowed for the generalized line compared to the original line. A higher value for tolerance will give a more generalised / simplified line. The figure below shows the result of applying generalize at the STYLE level with increasing values for tolerance (10 - green, 20 - blue and 40 - red). GEOMTRANSFORM simplify simplifies a geometry ([shape]) using the standard Douglas-Peucker algorithm. 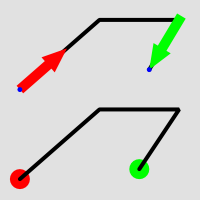 The figure below shows the result of applying simplify at the STYLE level with increasing values for tolerance (10 - green, 20 - blue and 40 - red). GEOMTRANSFORM simplifypt simplifies a geometry ([shape]), ensuring that the result is a valid geometry having the same dimension and number of components as the input. tolerance must be non-negative. The figure below shows the result of applying simplifypt at the STYLE level with increasing values for tolerance (10 - green, 20 - blue and 40 - red). 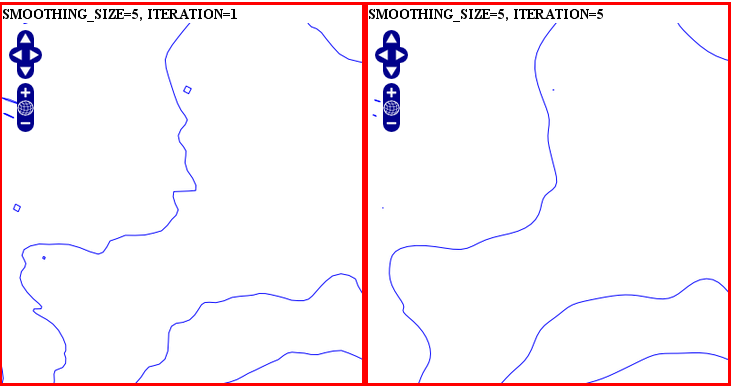 GEOMTRANSFORM smoothsia returns a smoothed version of a line. smoothing_size (optional). The window size (number of points) used by the algorithm. The default is 3.
smoothing_iterations (optional). The number of iterations of the algorithm. The default is 1.
all Adds two intermediate vertices on each side of each original vertex. 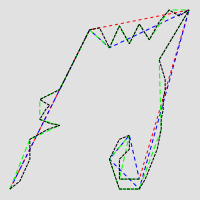 This is useful to preserve the general shape of the line with low resolution data. angle Add vertices at some specific places based on angle detection. Here are some examples showing results with different parameter values. smoothsia has several parameters that can be used to tune its behaviour. The following sections describe some cases / possibilities. 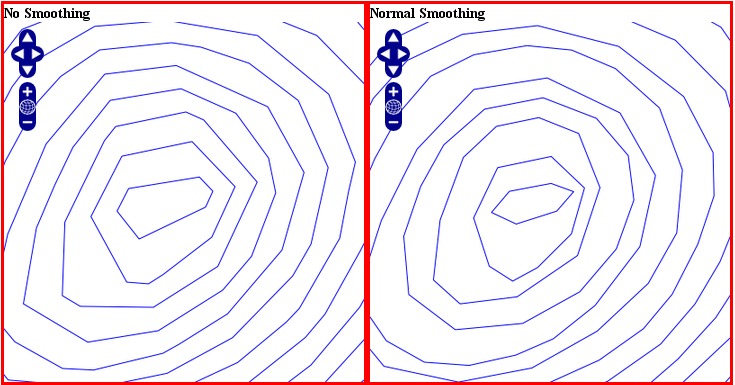 If you are trying to smooth a long line that has a low density of vertices, you may not get the expected result in some situations. You may lose some important parts of the geometry during the smoothing, for instance around acute angles. You can improve the result by enabling a preprocessing step to add intermediate vertices along the line prior to smoothing. This preprocessing will be performed before the smoothing. It adds 2 intermediate vertices on each side of each original vertex. This is useful if we really need to preserve the general shape of the low resolution line. Note that this might have an impact on the rendering since there will be more vertices in the output. Using GEOMTRANSFORM this way makes it possible to modify the geometry programmatically in addition to the built-in geomtransform functions. The path can also be absolute. Extends example 1 by printing information to the MapServer log. A minimal API is currently available to create a new shape. Returns the point at the index position. Add a point to the line. Add point to the line from an x,y[,m] values. Add point to the line from an x,y,z[,m] values. Returns a clone of the shape. Returns the line at the index position. Add a line to the shape. Replace the geometry of the object with the shape geometry.